Rick and Morty Presents: Krombopulos Michael #1 Review – AiPT! The Rick and Morty presents series is a welcome one because it devotes entire issues to fleshing out the colorful supporting characters we know and love. Some are obscure, others are huge fan favorites that garner swag and paraphernalia. Case in point, Krombopulos Michael. This series stars a Gromflomite assassin (the eponymous Krombopulous Michael) from the Rick and Morty universe that fits in perfectly (he loves to kill and commit ultra violence) we finally get a peek inside the character’s head. 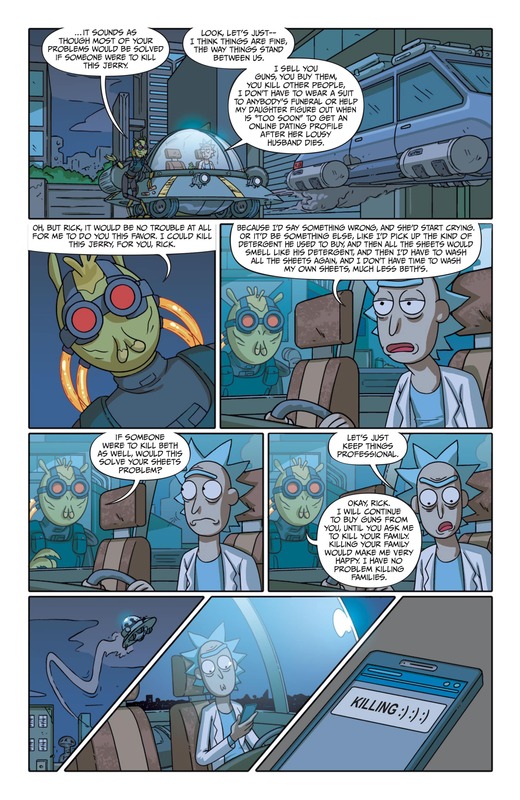 This comic follows his journey from pre-killer to the period in which he was practically begging Rick to kill Morty for him. That is one way to get coffee. The biggest takeaway from reading this that fans will gravitate to is how writer Daniel Mallory Ortberg focuses on the relationship between Rick and Krombopulos. We not only find out how they first met, but also why Krombopulos truly sees Rick as a dear friend. Given how insane Krombopulos is about killing you have to imagine Rick isn’t cool with the guy, but it’s heartwarming in how Ortberg crafts this character’s arc with Rick. The art by CJ Cannon continues to be fantastic and is well-suited to the style of the show. CJ delivers on the likenesses of the characters in a way that should help you think of these as lost chapters of the animated show. The gore isn’t held back too much which allows those gross-out gags to land well. Krombopulos commits a lot of murder in this issue (as you’d expect) and Cannon allows the brains (and eyeballs) to fly. One of the hardest elements pulled off here is how we commiserate with Krombopulos even though he’s a psychotic weirdo. Cannon makes you feel for the guy when he’s depressed and makes you actually root for him when he finds joy in murdering. We never see kids or animals being killed which may be one reason why it’s easier to feel for him, but he does commit violence and it’s done in a way that keeps things light. Rick grows tired of him and so might you. I didn’t find this issue very funny in part because Krombopulos’ repetitive way of talking about enjoying murdering grows tiresome. He’s basically a one-joke character who ends up being endearing more than anything else. This repetitiveness ends up dragging the book out in parts slowing the pace down. We also never get a good bead on why he likes to kill and instead get confirmation of it. If you’re expecting more development in this regard you may feel disappointed with how the story plays out. It gets better when Rick shows up since his relationship with Krombopulos is a big part of this narrative. Rick doesn’t add much humor either though and he even ends up being a character you commiserate with more than laugh with (or at) and that might throw fans off. That said, this series has been good at mixing drama with comedy so it shouldn’t come as that much of a surprise. I liked this issue in how it develops a relationship between Rick and one of the sickest characters in the universe. It’s also well drawn and it’ll scratch that Rick and Morty itch.